Some things are timeless. They are crafted so well, meet their purpose so perfectly, that they never feel old. If you have a classic Rolex watch, a Jaguar E type or an episode of Fawlty Towers, you aren’t remotely interested in the date it was made, only the quality, the precision and the way it makes you feel. SSX Tricky is timeless. It may be seventeen years old, but even now I will periodically load it up and still gain the same enjoyment that I experienced when I played it the first time around. In fact I recently started again with a blank save and played the entire game through from the start, just to enjoy the feeling of progression once more. 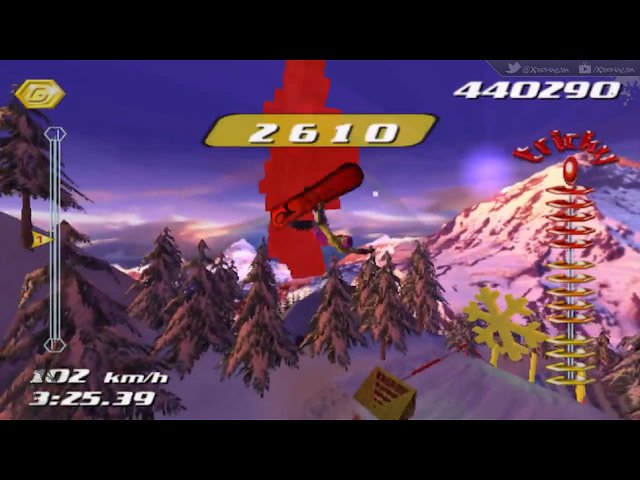 SSX Tricky is a snowboarding game, released by EA Sports BIG in 2001 for the Sony PlayStation 2 as a follow up to the original SSX. 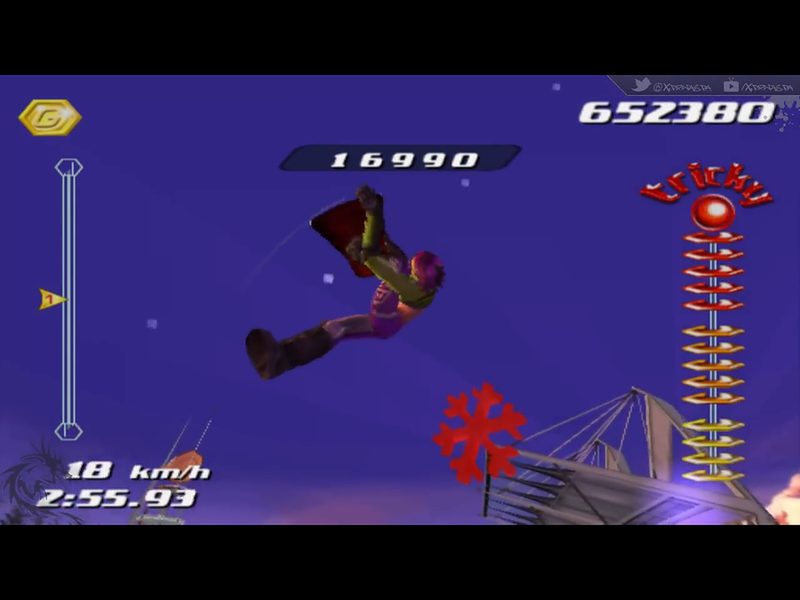 (It was also released for the Gamecube and original Xbox). 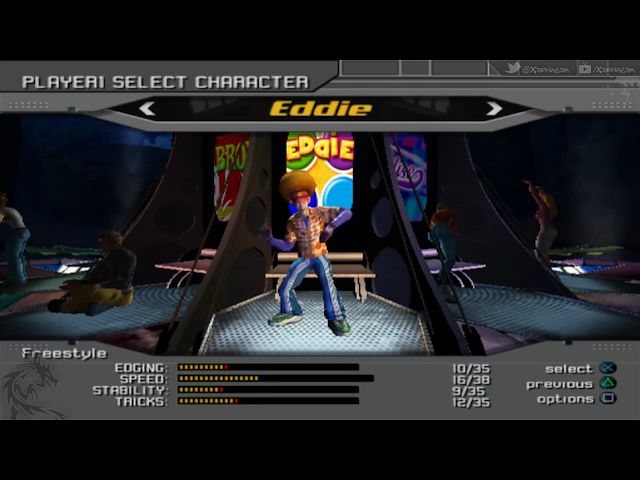 Set across eight levels you can play as one of twelve different characters in four different play modes. 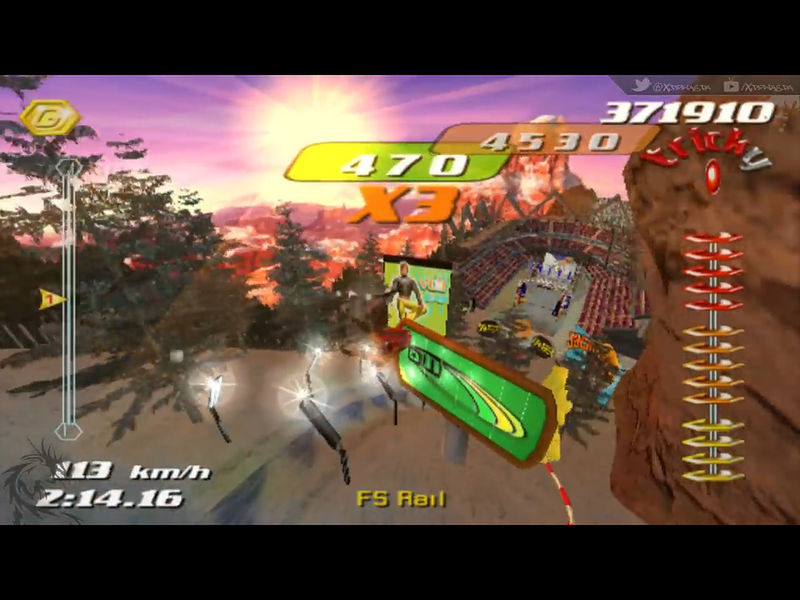 ‘Freeride’ and ‘Practice’ enable the player to practice and learn a course, though additional courses aren’t unlocked by playing these modes. 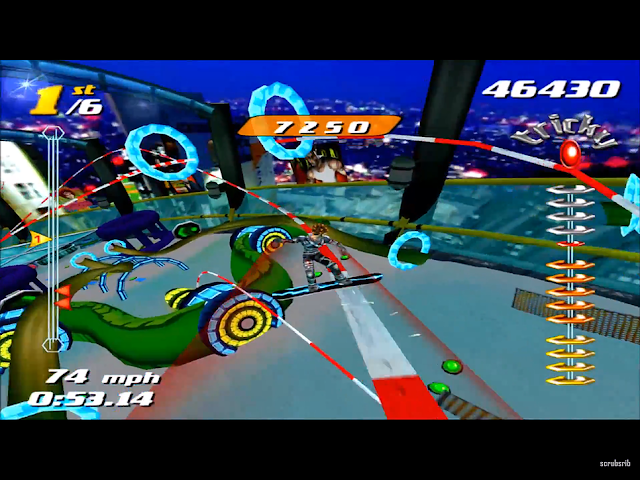 ‘World Circuit’ sees you competing against other opponents in a series of races and trick events. Finally ‘Single Event’ allows one or two players to play a single stage from the World Circuit section of the game. When racing In World Circuit mode, you make your way down the course aiming to be the first across the finish line. You can race ‘clean’ or try and knock your opponents over. Your fellow racers will react depending on how you treat them. If you target them and try and impede them then they will reply in kind. They will remember your actions too and will behave in the same way in future races. You race a quarter final, a semi-final and the final. A finish in the top three will ensure progression to the next race and if you can manage the same in the final then the next course for race events will be unlocked. The other mode within World Circuit is ‘Showoff’ and this is where the real fun of the game lies. Here the focus is not crossing the finish line first, instead you compete individually and it’s all about doing tricks and clocking up big scores. In this mode, each course is littered with a variety of ramps, jumps and rails. Holding down the ‘X’ and releasing just before the edge of a jump or while on a rail will send you into the air. 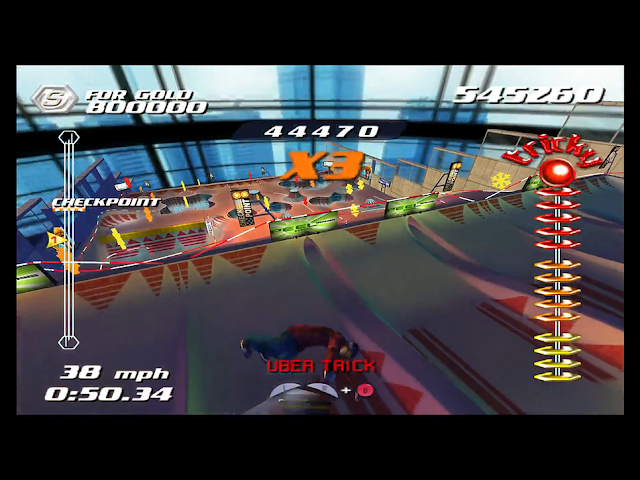 The closer to the end of the rail or jump you release the button, the higher your jump will be. Using your D buttons you can perform spins and flips while airborne and you can add flourishes and board grabs using the shoulder buttons. If you successfully land a jump you are awarded points and your boost bar will start to fill. 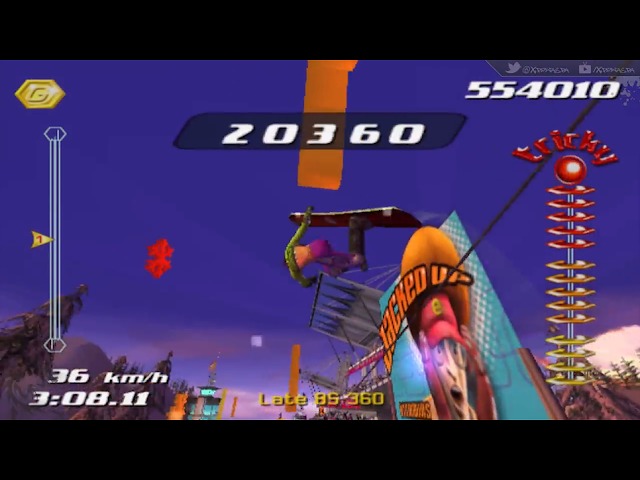 This boost can be used to gain greater speed which in turn gives you more air, leading to more impressive tricks. The boost will deplete while being used however so it needs to be saved when possible. If you fill the boost bar completely, you can perform ‘Uber’ tricks by holding one of the shoulder buttons with the square button. Uber Tricks are far more flamboyant and earn big points. If you land an Uber Trick you will be awarded a letter in the word ‘Tricky’ which sits on-screen. Do this six times and complete the word and your boost is then maxed out for the remainder of that level. 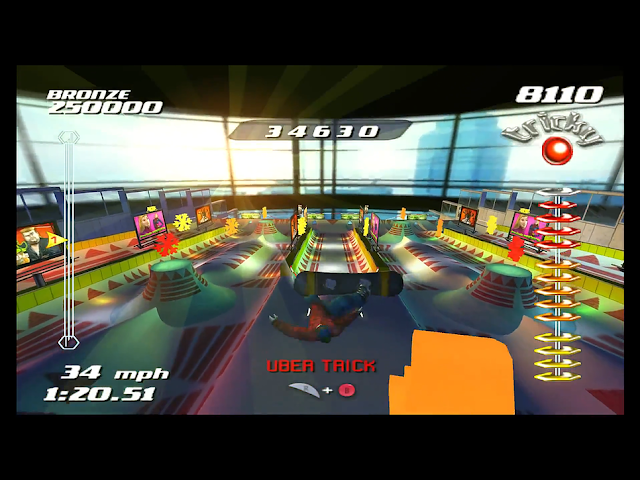 Each trick scores points depending on its complexity, and at the end your score is rated against the other competitors. Liberally spread around each course there are yellow, orange and red snowflakes hanging in the air and if you pass through one while completing a trick your score for that trick is multiplied by 2, 3 or 5 times respectively. If you can get ‘big air’ and nail a couple of Uber Tricks (or more) through a five-times multiplier your scores can skyrocket. Each level has hidden routes and other secrets to be explored. The first courses are relatively sensible, but buy the time you reach the Tokyo Megaplex they are simply insane. A myriad of ramps, chutes and air vents which propel your player high into the air ensure that you spend very little of your time at ground level. If you finish in the top three in either Race or Showoff mode you earn medals which unlock courses, new characters, bonus outfits and boards. Winning medals also means that you earn power up points, which can be used to improve the character’s speed, edging, stability, trick speed etc. You choose which element to upgrade which adds a strategic angle to progression. The graphics are fantastic and look much better in motion than the screen grabs can convey, with each course and character having a distinctive and individual look. The courses are solid and very well designed, with enough freedom to let you pick your route, but not so much that you feel lost. The sound and music is excellent, the music reacts to the action on screen and the character voices were provided by celebrities such as Lucy Lui and Macy Gray as an interesting twist. But it is in the gameplay department that this game truly excels. 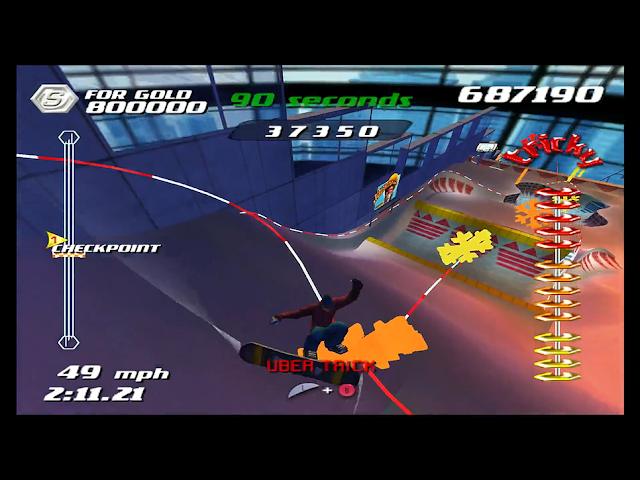 Easy to pick up but difficult to master, the controls are intuitive, precise and, once you get the hang of landing your tricks, hugely satisfying and rewarding. When you land your first Uber Trick you will be smiling like a Cheshire cat and when you nail your first double Uber Trick through a red multiplier you might well find yourself becoming a tad moist. Negatives? For me at least this game is all about the Showoff events in World Circuit mode. Everything else is a bit of a bolt on, with the racing being okay but not nearly so much fun. If you want a racing game there are certainly better options available. Also, the Showoff levels, while brilliantly designed and nicely diverse are a little uneven in terms of difficulty level. Some can be cleared on a first attempt, but when playing through the game from scratch I found ‘Mesablanca’ and ‘Aloha Ice Jam’ particularly tough to qualify from. That is not to say that trying isn’t fun, but the difficulty seems to spike unnecessarily. In the years since 2001 there have been numerous incarnations of the SSX franchise across a number of platforms, but none have captured the feel of SSX Tricky. In Tricky, although you had plenty of freedom to choose a route down your course, you were always working within a defined play area. Later versions expanded this and provided the player with far greater freedom to explore, which I believe resulted in a game that was more realistic and impressive, but ultimately not as fun. 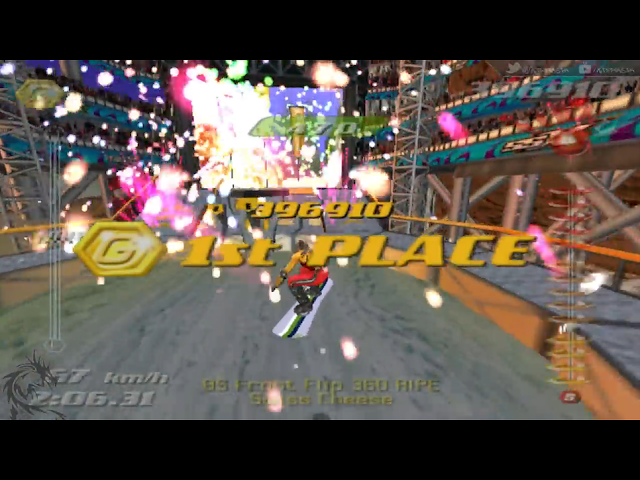 I am not in any way a snow-sports fan and before I played the original SSX this was not a game that would have appealed to me. But this is so well executed and is such fun, it is impossible not to fall in love. A great selection of characters, boards, locations and tricks add up to a deep and comprehensive gaming experience. It will take many hours of play to unlock all the courses and even when you have there is stacks of replay value. 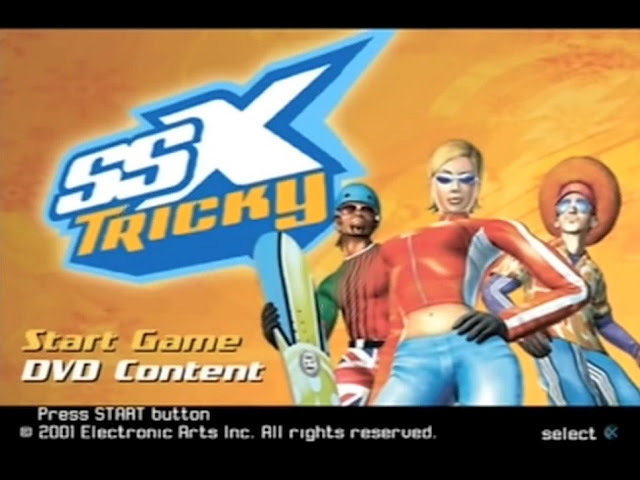 Thoroughly enjoyable, challenging, rewarding and brilliantly executed, SSX Tricky is genuinely a timeless classic. As good today as it was in 2001, this is an absolute gem for the PS2 and deserves to grace any collection.